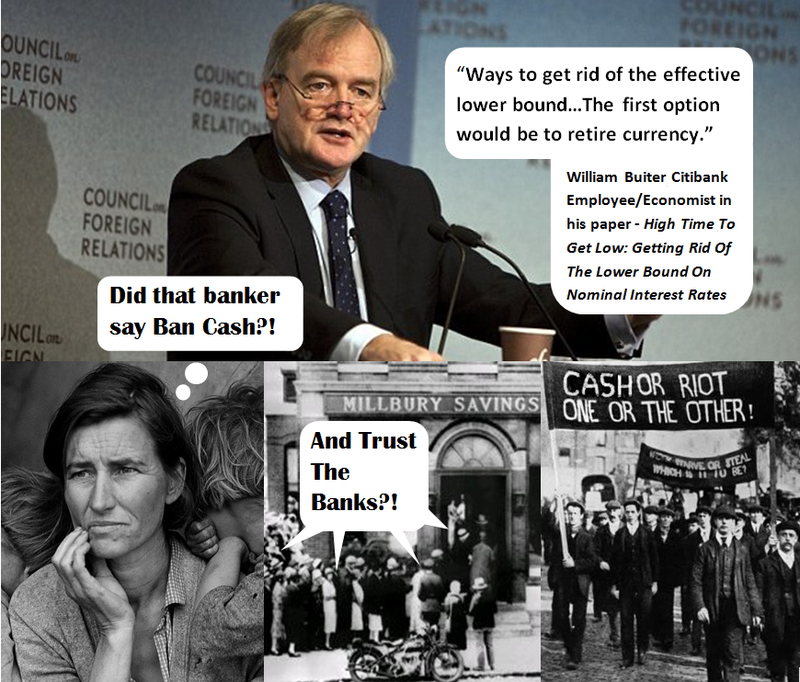 Why do economists currently feel as if it is acceptable to discuss banning the use of cash? There is the obvious answer that since their go to solution to periodic faltering of the debt based monetary system of lowering interest rates has hit an end point at the zero lower bound, they feel it is necessary to implement negative rates. Yes they certainly see a necessity, which is interesting, considering they would never admit that changing the monetary rules is an indication of failure of their theories. Yet there was a time when going cashless would have been seen for what it is, a major limitation of freedom, and it wasn't that long ago. There is an entire generation that learned firsthand not to blindly trust the banking system, and appreciated the freedom to remove their assets from such a racket. That generation were the adults that lived through the great depression. To save the banking system the government had to insure deposits to instill some trust in the industry that hurt so many. By insuring bank deposits the government succeeded in keeping the banking industry alive, but this was done not at the expense of the banks but the American tax payer. Said another way the banking system was saved by the government forcing depositors to ensure their own deposits. The failure of banks and loss of savings during the great depression left a permanent mark on the memory of many who lived through it and many never trusted putting their money back into the banking system again, opting instead to keep cash at home. I contend that the reason economists can talk about a cashless society with out any push back is because the limits of society’s memory of the dangers of the banking system. Consider when a person is no longer politically involved. I think most are finished being politically involved, at latest, between 85-95 years old. This is supported by the ages of the oldest members of congress, John Conyers and Louis Slaughter at the age of 85, as well as Senators Dianne Feinstein and Chuck Grassley at 81 years old. The oldest of the politically active citizens were born during the great depression and would not have the strong feelings about the protection of cash that a person that was an adult during that time would. This talk about going cashless would likely have been squashed in the 1990’s by the outrage of those in their 70's, who would not see it as some sort of progress, but an affront to liberty. Paper dollars are far from a perfect medium of exchange, they are not durable, they do not maintain their value, and they are more difficult to use than a credit or debit card, but they do afford some freedom. Freedom not only from what is becoming a more brazen government but a very much connected and reckless banking system. There are those that would argue that since the great depression no one in the US has lost their money by holding it in a normal banking deposit thus the actions of those that lived through the depression, never trusting and many not using the banking system, were wrong and narrow-minded. It is a mistake to come to that conclusion. Just because it hasn't been necessary for 80 years does not mean that it won’t be necessary again. The Cypriots in 2013 experienced a 47.5% loss on deposits over 100,000 euros in a so called bail-in to save their banking system. It is feared that the Cypriot bail in model is a blueprint for future banking crises. Let’s also not forget that the reason for banning cash is specifically so that depositors will lose money through a negative rate of interest each year.